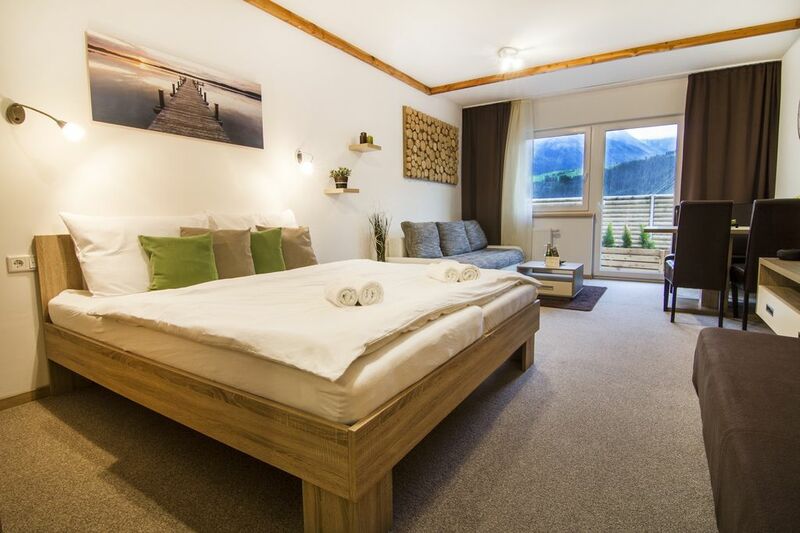 Brand-new studio apartment with the scenic mountain view and great location, only 10min to Kitzsteinhorn and Zell am See! Enjoy a choice to cook in your own kitchen or eat at the price-friendly restaurant. Enjoy your holidays in the cosy and modern apartment situated right in the heart of Alps. Spacious for couples and convenient for a family or bunch od friends since it can accommodate up to 5 people, two on a double bed, one single bed and a fold-out couch. The apartment has got its own terrace with the garden furniture which is a nice place for morning breakfast. Its kitchen is fully equipped for cooking including stove, fridge, dishwasher, and coffee machine. Movies and music fans will surely appreciate flat screen TV with USB input and decent hi-fi with radio. If you dont feel like cooking you can visit price-friendly restaurant where you can order buffet breakfast or three course dinner. Restaurant along with the bar are located on the same floor as the apartment. Moreover, there is also a spacious sauna in the apartment building that you are welcome to use for a fee. Finally, there is free WIFI connection, parking lot in front of the apartment and bike/ski storage just opposite to the room. You do not need to bring towels and bed linen as they are provided. In case the aparment is not available for your dates or you need one more aparment for other friends/family, check out the second apartment on my profile which is situated in the same building with the similar set-up. Or you can always contact me and we will try to find a solution that would suit you.